Yesterday morning I received a surprise while checking out my friend Tracie’s blog at Cleverly Inspired. She has always been creative and on the lookout for what she could transform next. Even back in high school we would venture to a local stencil store, buy wooden things and then paint and stencil them- we were real trouble makers!! Tracie can walk into a thrift store and take someone’s unwanted items and turn them into beautiful and useful things for her house. I am inspired by her to look at things with a different eye and see what other uses they may have in store for me. I am a complete novice at this blogging thing but she granted me this award after only one month of blogging (I even had to ask her how to respond to this award!!) 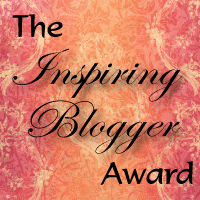 and so I am entitled to pass on this award to other bloggers who inspire me! 1. Nourish Life Coaching Alexis Robin is one of the most positive people I have the pleasure of knowing. She is so down to earth and can relate to what others are going through but has a natural way of helping them move beyond the frustration to discover the joy and bliss of every day life. She sees the power and greatness in people that they may not see in themselves. I am honored and blessed to call her a friend! 2. After Autism Diane Hunter’s calm, peaceful energy comes through her written and spoken words. She inspires me to keep my energy calm for my son and to stay in my own business, even with tantrums around me. She has been there, is there and will continue to persist in her effort to heal her own son. It means the world to know that there is a mother out there who is able to stay positive, help others get through their own challenging situations while never forgetting the importance of caring for and loving oneself. She inspires me to want to help other parents just as she has helped me. 3. The Worst Mother She inspires me to embrace all of the different aspects of who I am. She wears so many hats in her life and her blog conveys a fabulous personality with the important ability to laugh at oneself. Lin, I wear all of my hats with pride and with a giggle in my heart because of you! !